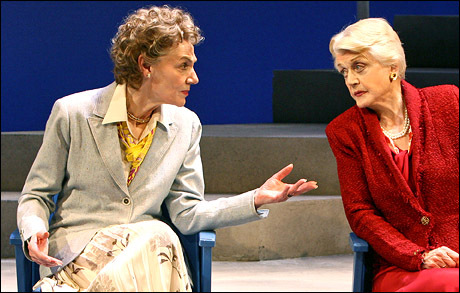 Marian Seldes (left) and Angela Lansbury starred in Terrence McNally’s “Deuce.”/Photo courtesy of Playbill.com. Marian Seldes, who has a spot in the Guinness Book of World Records for never missing a single performances in her Tony Award-winning performance as the wife in “Deathtrap,” died Monday in Manhattan, the city she loved. I talked to her several times over the years as a journalist as well as a theatergoer when she was taking in the same show I was. She was always gracious, reaching for my hand and patting it while being gracious to a fan. She made her Broadway debut in 1947 as a serving girl in “Medea” directed by John Gielgud and starring Judith Anderson, and last appeared there in 2007 in “Deuce” opposite Angela Lansbury. She is perhaps most admired for her many performances in plays by Edward Albee. For a list of her Broadway shows, click here. For the NY Times obit, click here. For Ben Brantley’s appreciation, click here.